If you are a CAT 2018 aspirant which is scheduled to be held on Sunday, November 25, 2018, good vocabulary must be your 1st agenda. It is very important for a high CAT percentile as it is required for solving almost all the questions based on Sentence Completion and Reading Comprehension in CAT Exam .You need to have a good vocabulary for writing meaningful essay in written ability test conducted by IIMs after CAT. Good Vocabulary gives your imagination wings and helps you express your thinking in exact word, phrase and sentence. In Vocabulary for CAT 2018 you will come across many difficult words. Each correct answer in CAT 2018 is worth roughly 1-2 points. Even if you could increase your Word Power marginally, you could have many more correct answers and a significantly higher score and a good vocabulary is inextricably linked to a good memory. To have a deep and wide vocabulary, a student needs a very good memory. So how do CAT Winners go about developing a good memory? The commonly accepted idea we all believe is that ‘more memorizing makes memorizing easier’. But it has been proven false. However, practice may result in an unconscious improvement in the winning methods of memorizing. By practice a student can reflexively discover and employ new associative methods in recording facts that makes it easier for students to recall them. Together with good memorizing power, you need to have good retentiveness as well but the real cause of a poor memory is not the loss of retentiveness, but the loss of an intensity of interest. We can easily recall things by their associations. When you set your mind to remember any particular word, your conscious effort should not be to vaguely mug it up but to understand it and retain so that it shall be impressed and retained. The student who will "cram" for Cat 2018 will not be able to makes any permanent addition to his knowledge. As recall without association is very difficult and sometimes confusing and "cramming" allows no time to form associations. Therefore, if you find a word difficult to remember, do not waste your energy on mugging it up and then one emphasizing it to return. Try to recall some other fact or name associated with it. If your memory is good in most respects, but poor in a particular line, it is because you do not interest yourself in that line, and therefore have no material for association. To improve your memory you must increase the number and variety of your mental associations. Many ingenious methods, scientifically correct, have been devised to aid in the remembering of particular facts. These methods are based wholly on the principle that that is most easily recalled which is associated in our minds with the most complex and elaborate groupings of related ideas. Make systematic use of your senses. Do you find it difficult to remember names? It is because you do not link them in your mind with enough associations. Every time a man is introduced to you, look about you. Who is present? Take note of as many and as great a variety of surrounding facts and circumstances as possible. Think of the man's name, and take another look at his face, his dress, his physique. Think of his name, and at the same time his voice and manner. Think of his name, and mark the place where you are now for the first time meeting him. Think of his name in conjunction with the name and personality of the friend who presented him. Memory is not a distinct faculty of mind in the sense that one student is generously endowed in that respect while another is deficient. Memory is wholly a question of trained habits of mental operation, and can be improved. Your memory is just as good as any other student of CAT aspirant. It is your indifference to what you would call "irrelevant facts" that is at fault. Therefore, cultivate habits of observation. Fortify the observed facts you wish to recall with a multitude of outside associations. Never rest with a mere halfway knowledge of things. However, that does not imply that you have to act as an observer always. You only need to observe that you know you will come across later as well. For instance, you need not observe each and every person in a metro but you should definitely observe who pays regular visits at your place. Many CAT winners have successfully used one or more of the strategies below to remember many words of difficult wordlists in just a few days. In all your images, try to distort size and shape. You can imagine things much larger than their normal size or conversely, microscopically small. You could visualize footballers kicking a television around a football pitch instead of a football, or pens growing on a tree instead of leaves. Substituting an out of place item in an image increases the probability of recall. Try to picture vast quantities in your images. Any movement or action is always easy to remember. For example, you can see yourself cutting into an apple and gallons of juice squirting out and hitting you in the face. e.g. the word ricochet means to bounce or skip off. The funnier, more absurd and zany you can make your images, the more memorable they will be. For example, the word torpid means slow. Torpid can easily be linked to Torpedo. Imagine a Torpedo chasing away a tortoise. Imagine the tortoise trying to get away from the torpedo and the torpedo unable to keep up with the speed of the tortoise. Imagine it happening in a small path in the Jungle. Imagine the torpedo making a hissing sound. Make the picture as vivid as possible. This will never let you forget the meaning of torpid again. Thus, applying any combination of these five principles, when forming your images, will help make your mental associations truly outstanding and memorable. At first you may find that you need to consciously apply one or more of the five principles in order to make your pictures sufficiently ludicrous. After a little practice however, you should find that applying the principles becomes an automatic and natural process. The one thing that distinguishes an impressive and effective speaker from the ordinary ones is vocabulary. When you learn new words, make sure you learn them in a context. It is much easier to picture a sentence rather than a word in isolation. Since a lot of English words are derived from Greek & Latin roots, it makes sense to be aware of these and the suffixes and prefixes commonly used. This could help you guess when in doubt, especially in the Sentence Completion section. Play games like scrabble & crosswords. This will make building vocabulary fun and you will not get put off after sometime. Perhaps the Best way to increase your vocabulary is to read, read and read. There is absolutely no substitute for that! 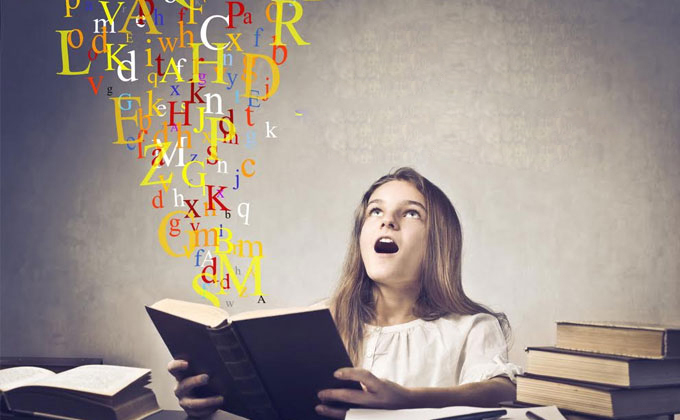 Reading helps you learn new words from the context in which they are used, thereby making it easy to remember the new words and more importantly, how and when it is used.